Ultra-thin bendable lighting and displays may be about to go from curiosities to useful products. OTI Lumionics, a Toronto-based startup, is developing lightweight materials that can be used to make bendable lighting and displays. The next big step in technology could very well be a flexible one – or so OTI Lumionics Inc. is hoping. The Toronto-based startup is developing lightweight materials that can be used to make bendable lighting and displays. The company’s ambitions are lofty: To change how consumer goods are designed and manufactured. “The reality is the advances in software, communications, data processing and storage all rely on underlying advancements in computing hardware – and all of those are made possible by new materials,” says Michael Helander, company president and chief executive. OTI Lumionics lab in Toronto. OTI Lumionics, founded in 2011 by Mr. Helander and three co-founders, Zhibin Wang, Jacky Qiu, and Zhenghong Lu, is currently working with large consumer electronics manufacturers in Asia toward that goal. Several of those companies, including South Korea’s Samsung and LG, have already brought curved televisions to market and are expected to double-down on flexible display technology in the coming years. Samsung, for example, has said it is working on a bendable smartphone with a foldable screen, with a possible release coming as soon as this year. The main benefit of such a phone would be that its flexible screen would be difficult to break. Mr. Helander says he is unable to name his company’s partners due to the secretive nature of the industry, but he expects that to change within the next 18 to 24 months. With that facility up and running, the key to the next era of product and manufacturing design will be speeding up materials research and production, Mr. Helander says. Traditionally, that process takes years because it requires many different materials to be physically tested. Hardware advances are therefore considerably slower than software development, which can move at lightning speed. OTI Lumionics is instead using artificial intelligence to simulate much of its testing, which eliminates dead ends more quickly. The company can then physically test materials that win out in simulations in its production facility. “We can filter down a lot of candidates that will probably fail and focus on just a few that have a very high probability of success,” Mr. Helander says. OTI Lumionics showed off its capability earlier this year by embedding its flexible, ultra-thin OLED lights in the front cover of Frontier, a magazine published by the Toronto-based design company of the same name. The cover, fronting an issue focusing on the theme of darkness, featured a small rectangular section that lit up when touched. The project, done in collaboration with Frontier and Toronto-based printer Flash Reproductions, took about a year and had a total print run of 1,500 copies. The biggest obstacle wasn’t inserting the OLED light itself into the cover, but rather the battery to power it. 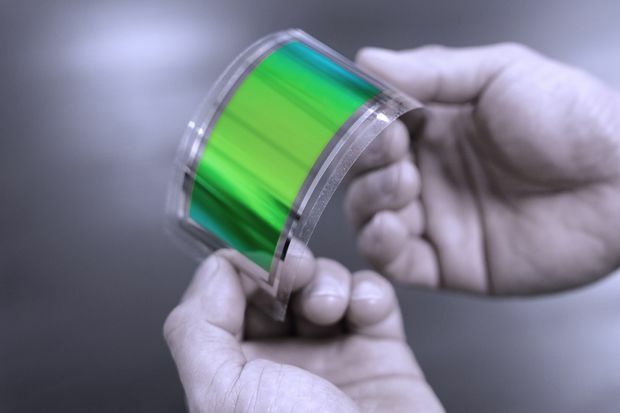 OTI Lumionics took several months to develop a flexible battery, at which point the project became feasible. The technology is there, but the cost isn’t yet. Mr. Pauptit says the cost of producing the cover alone was about triple that of the entire magazine. He expects that to change over time as costs fall, at which point flexible lighting could become the next big thing, especially in product packaging. “There’s more of a hunger to catch people’s attention there,” he says. A wristband with flexible lighting. Industry analysts do indeed expect a quick drop, which means ultra-thin bendable lighting and displays may be about to go from curiosities to actually useful products. “The problem with flexible displays has always been being able to produce it in mass quantities. We’re about to get there,” says Jean Philippe Bouchard, vice-president of mobility and consumer research at IDC Canada. So far the market has consisted mostly of curved televisions, which consumers have largely shrugged off as gimmicks. But that is likely to change once the underlying materials become cheap enough to enable new modes of thinking about product design. That could in turn spur the creation of previously unimagined goods. “Everyone will say, ‘The TV I have today is good enough, why would I want something better?’” Mr. Helander says. So what can be done with bendable lights and displays and why would anyone want them? Inventors, entrepreneurs, manufacturers and consumers will ultimately answer those questions, but a few intriguing possibilities already exist. Bendable phones and tablets offer the promise of better durability – it’s hard to break a flexible screen, after all – but also more display space. A smartphone could have a regular 2.5-inch-wide screen, but also unfold – like a book – to reveal a second five-inch-wide screen on its inside. Such a large screen could be more desirable for watching videos or reading texts such as e-books. “Here’s a big screen when you need it and here’s a smaller screen when you don’t need it,” says Jean Philippe Bouchard, vice-president of mobility and consumer research at IDC Canada. Lighter, flexible lights could also make a big impact in car design and manufacturing, especially with the move toward electrification. Auto makers are looking for ways to decrease overall weight as heavier vehicles require more battery power. OTI Lumionics’ co-founder Michael Helander foresees replacing big, heavy tail lights with ultra-light OLED “stickers” that wrap around the rear of the vehicle. “We’re starting to now see a new generation of lighting design,” he says.